As language, confidence is fundamental to communication, and an important catalyst to the whole process and the enjoyment at every step. As human beings, it transcends and includes the way we communicate, perceive others, and are perceived by them. Confidence is the most tangible expression of who we are. It defines not only how we express ourselves (in any language), but how we perform at work, how we interact with people, and the vigor with which we pursue our goals and dreams. If it is such a crucial component to success in life and communication, how can we apply this to language learning? 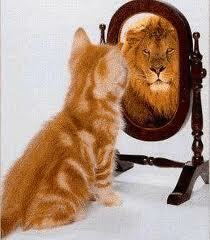 Where does confidence come from? Does grammar come from confidence or does confidence come from grammar? 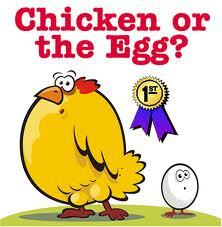 It’s kind of like the chicken and the egg analogy (which came first, the chicken or the egg?. I personally think they are equally important, but the problem in English learning (and teaching) is that people tend to ignore the more complicated internal dimension that CONFIDENCE suggests. This is where the great teacher inspires, opening the door to the enthusiasm of more dynamic forms of learning. Beginners think to themselves: “Someday I’ll learn enough grammar to be able to speak English.” Why? Because they don’t have the confidence to use it now. They are insecure. They’ve learned that fluency will come from understanding the technical aspects of the language. They forget the human element of confidence that can only be realized or developed by finding the courage to open your mouth and make mistakes. Whether you are a beginner, intermediate, or advanced learner, perfection isn’t nearly as important as believing in who you are as a human being, and feeling okay with your place in a language learning process. If you feel okay with yourself, people will feel okay with you. This is not a question of your English as much as it is as what you believe about yourself. How do you feel when you speak English? For me, as a native speaker of English, it’s a lot easier to speak English with a non-native speaker who makes a lot of mistakes in a relaxed, confident manner than it is to speak with someone has perfect grammar but lacks a basic sense of confidence. We all intuitively know this. Sometimes we think that the really fluent English speakers simply have a natural ability to learn languages, but if we sit back and observe, we start to realize that a lot of them are just naturally confident people. They have supreme confidence in everything they do, and they have simply applied this to learning a language. Of course it’s more complicated than this, but confidence can fix a lot of things. I know the psychological aspect of language learning is a puzzle to many people. I mean, it’s not easy to measure confidence. To diagnose yourself, you need self-awareness, and for most people it’s a deeply personal and complicated process. Although it is hard to teach and even harder to diagnose, you can look into yourself and explore how you can improve your confidence, not just to speak and learn a language more effectively, but to improve your life. If you enjoyed this article please let us know what you think! Take a second to COMMENT below. Love English? Remember to join our international community where you can practice with native speakers, teachers, and other language learners like yourself! When you speak confidently you don't give people the option of misunderstanding you. If you speak gibberish, but speak it confidently the other person will think something is wrong with them if they don't understand. I want to learn speak to english frequently but I am not confident for spoken. So please advise and support. As a teacher and a student of language this is a refreshing reminder of a very fundamental part of the language learning process. It reminds me a little bit of the quote I rediscovered yesterday, “We should find perfect existence through imperfect existence.” Again, thanks for another great blog post! I admire how Real Life English has made learning English so dynamic and fun, very creative! Danielle, Thanks for your comment! Very succint! I think Brazilians are really charasmatic people and it’s important to apply this natural gift to English too! I loved the article!! I consider myself fluent, but when I have to talk to a foreign person in English, everything I know disappears and I know it’s about my confidence. Psychological bariers in language learning are always hidden by nature. This is why it is difficult to eliminate these bariers. You really made a perfect explanation for the role of them in the process of language learning. I feel very happy and confident to read this article.. And almost resolved my lots of doubts and anxiety about english speaking and listening.. Sometimes I experienced severe plaintiff feeling and fear to hear good english from a professional..Ha..Ha. may be the coming days I can reduced it slowly.. Because I am working on it..
Now I am looking for a good job here in UAE, I searched lots of job, wandering many days on the crowded streets..Lack of proper english fluency and UAE experience they rejected me..